In cooking shows, we often find chefs use garlic to add additional seasoning to food. From pan frying to baking, garlic can turn the food into bold and aromatic dishes. But apart from its role in the culinary industry are its numerous health and therapeutic benefits. Garlic is a member of the lily or Allium family. It is rich in a variety of sulfur-containing compounds- thiosulfinates, sulfoxides, and dithiins. Despite being the source of garlic’s pungent odor, they are also the source of its health-promoting contributions in the community. Aside from sulfur that is important in our health, garlic also contains manganese, selenium, Vitamin B6 and Vitamin C.
Garlic is able to moderately decrease blood triglycerides and cholesterol. Despite this test running on garlic oil, garlic powder or garlic extracts instead of the actual food form, we can’t disregard the fact of this benefit. Oxidative stress is also two major causes of cardiovascular problems which can increase risks of heart attacks and atherosclerosis. Inflammation on the other hand can cause clogging in the blood vessels and plaque formations. Garlic’s sulfur-containing compounds helps protect us from oxidative stress and inflammation. Ajoene is the particular disulfide responsible for keeping platelets in check, thus, preventing it from becoming too sticky. This lowers the risk of the platelets clumping together forming a clot . 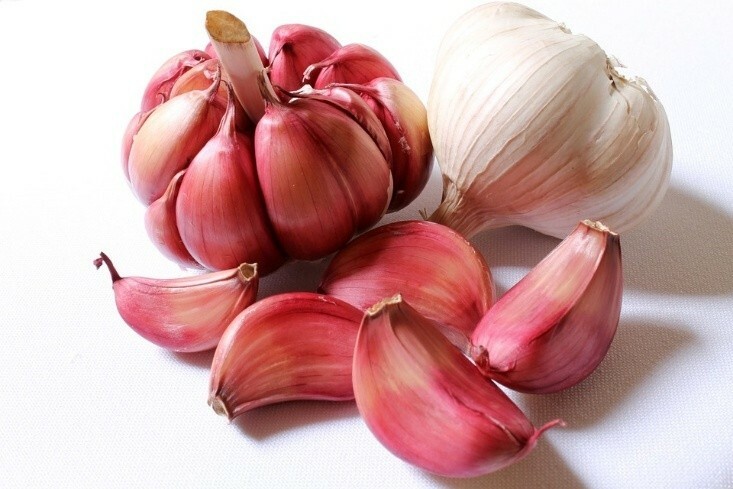 Allicin from aliin in garlic blocks angiotensin II activities by preventing it from the contractions of blood vessels and lowering our blood pressure in the process. Selenium and manganese found in garlic serves as a cofactor as antioxidant enzymes of the body. In animal studies, aged garlic extracts have shown characteristics to reduce and help moderate and improve inflammation from certain body parts. Anti-arthritic compounds are foundindiallyl sulfide (DAS) and thiacremonone. Fresh garlic extracts and powdered garlics undergone researches that promotes garlic’s medical standpoint. Bacteria and viruses can be controlledby the presence of garlic. And not only that, but also infection from yeasts or fungi and even worms. Crushed garlic even helps prevent infection caused by the bacterium Pseudomonas aeruginosa from burn patients. For bacterias that have become resistant and tolerant of antibiotics, garlic is also able to treat bacterial infections from such. Garlic also helps regulate the body’s response to infection caused by the bacterium Helicobacter pylori that is a factor for ulcer. Cancer is one of the most deadly diseases from a lot of countries. And surprisingly, our kitchen ingredient garlic has anti-cancer components. Daily intake of garlic lowers risks of all cancer types except for prostate cancer and breast cancer. Several intakes per week on the other hand lowers risks of colorectal and renal cancer. Garlic has a consistent record of anti-cancer benefits. One of the key components found in garlic that plays a major impact in its anti-cancer benefits is the allyl sulfides. These compounds can activate nuclear erythroid factor (Nrf2), a molecule found in the main cells. When Nrf2 transfers to the cell nucleus, it triggers several metabolic activities. This event prepares the cells for engagement for strong survival response, such as in oxidative stress, or in some cases, programmed cell death or apoptosis. Nrf2 suggests that garlic helps cell respond to prevent develop cancerous cells from the body. Ferroportin is a protein that helps iron return to circulation. It runs across cell membranes and assists the stored iron to leave the cell. Garlic is able to increase the body’s production of ferroportin that makes the circulation of iron easier for the body as needed. Garlics are arranged in a bulb-like image consisting of individual cloves. Cloves can be easily removed by fingers. One done, placing the garlic ‘cheeks’ side down and applying pressure with the flat side of a knife can ‘loosen’ up the skin, abling you to easily remove it with your fingers or small knife. Despite its numerous health benefits that aid life, garlic does have a new side effects that we all should be wary about. This includes bad breath, heartburn, upset stomach, body odor, nausea and vomiting. It may also increase risk of bleeding especially when taken raw. Some studies also show it may cause damages to brain cells. It can also cause inflammation or burn the lining of the intestines that can lead to perforations if eaten often. Note : –This article guest posted by Nadia Bima , the Co- Founder of KitchenLifeHacks, a specialized Magazine about kitchen enhancing Tips ,and dedicated special Forum. She aspires to help her readers by sharing personal tips learned through both years of experience and thorough research. Want to submit a guest post? Read HealthResource4u guest submission guidelines.